I’ll make this quick since there is no controversy in how the Rockets took care of business last night beating Detroit, blowing them out with a 19-6 run to close out the game in a 97-83 victory. Luis Scola is making a great case for an All-Star spot with 35 points on 16-of-25 shots, one point short of his career high at Golden State in the second game of the season. Kyle Lowry’s growth as a point guard continues, scoring 22 points and racking up 12 assists and 6 steals, both career highs. It’s going to be interesting to see what happens when Aaron Brooks returns to the court soon since Lowry has raised the bar on Houston’s point guard expectations. A little bit of pressure to be more of an assist man isn’t a bad thing. The part of Lowry’s game that has made him even more dangerous is his 3-point shooting, which has drastically improved over the past few games. He was 4-for-5 from 3-point land, and 11-of-19 over the past four games. Joining forces in the 20+ scoring club for Houston was Kevin Martin, who continues to amaze with his aptitude to get to the line, hitting 14-of-15 free throws. Who would have thought just a couple of years ago the Yao Ming/Ron Artest/Tracy McGrady “Big 3” would be replaced by the Scola/Lowry/Martin triumvirate? Add Yao and Aaron back into the mix, and you’ve got a very formidable lineup that could get the Rockets back into the playoff hunt as they face a very weak schedule of teams in December to make up for all those opponents they faced before last night’s game. But they’ve got to play defense like they did Tuesday night, although Rip Hamilton getting himself ejected from the game gave the Pistons little hope offensively. Speaking of McGrady, his return back to Toyota Center for the first time since leaving the Rockets provoked an interesting reaction. I heard many more boos than I had anticipated, but perhaps that’s because most of the crowd got word that McGrady dissed Houston before the game by saying the Rockets’ poor start this year is correlated with his leaving, or something like that. Yes, it was your fault McGrady, and you hold partial blame for sucking tens of million of dollars from the Rockets’ cap the past two years in Houston when you hardly played, taking us through all of your drama, and handcuffing Houston from being able to get a legitimate free agent during your last two years here. Back to Houston’s roster: Chase Budinger continued to struggle Tuesday, hitting only 2-of-6 shots, including an air ball on an open jumper from the free throw line, then missing 2-of-3 free throws after getting fouled on a 3-pointer. I haven’t seen a “sophomore slump” like this one in quite some time. Something has got to give here with Budinger’s playing time. Rick Adelman said before the game that he was going to play more of Jermaine Taylor so he can add some size to the backcourt since Ish Smith isn’t all that big (and he’s not playing so spectacularly to give him lots of minutes). We’ve been calling for more playing time for Taylor for weeks, so I’ve got to give credit to Adelman for adjusting like he did with playing Jordan Hill more. But he only gave 6 minutes to Taylor on Tuesday night. Hopefully we’ll see more of them, although the Rockets might not need him as much with Milwaukee (7-13), Cleveland (7-14) and Sacramento (4-15) as upcoming opponents. If there was ever a chance for the Rockets to break an 8-year losing streak to the Pistons in Detroit, this was it. The Pistons had lost 6 of their last 8 games, and 3-of-4 in Detroit. They were also blown out by Dallas 112-91 Friday night, giving up 54.9% shooting in that game. And although Yao Ming wouldn’t play so he could rest his knee in order to play against the Knicks Monday night in New York, the Rockets were getting Ron Artest and Tracy McGrady back, the first time they were to play on the court at the same time in 3 weeks. Sidelined because of a knee bruise, Yao Ming signs autographs among respectful Detroit fans. Click here for more photos. It was a back-and-forth game where you thought a couple of times the Rockets were going to pull away easily for a win, but the lack of defense without Yao in the middle to clog up the lane ended up really hurting them. But luckily with some clutch rebounds and free throws by Ron Artest in the last couple of minutes of the game, the Rockets prevailed, won their 7th game out of their last 9, and finally exorcised some demons in Detroit. Yao Ming shoots over Detroit’s Rasheed Wallace Wednesday night. 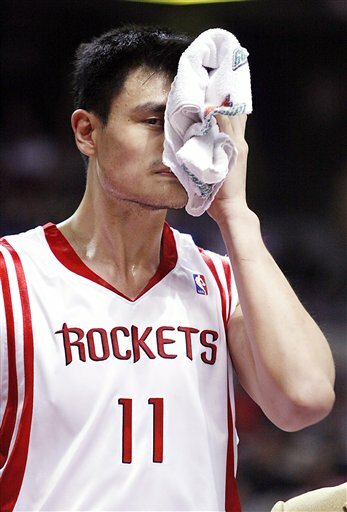 Yao scored 21 points, grabbed 13 boards, had 3 assists, and blocked 4 shots. He also hit some big shots in the fourth quarter that were instrumental to a close 80-77 win. Click here for more photos from the game. It was ridiculous how the Rockets escaped with this win. They overcame one of the worst free throw shooting games ever (6-of-22), the Pistons were extremely cold in the first half shooting only 27% from the field, the Rockets blew a 14-point first half lead, a 10-point lead in the 4th quarter, and the Pistons had two chances at the end of the game to win it on two consecutive three-pointers that missed. But the Rockets will take a win anyway they can get it. That’s how desperate they are for W’s. The game started out with Rick Idle-man not rewarding the players who had given effort in Philadelphia on Monday with a starting assignment. Luther Head, Mike James, Kirk Snyder, Luis Scola and Bonzi Wells were all on the bench to start the game. James and Snyder didn’t play one minute of the game, and neither did Steve Francis. It was clear from the outset that Idle-man was going to stick with his old ways, hunker down with a few key players, and be more conservative than ever to scratch out a win any way he could. He even had McGrady consistently playing point guard in the fourth quarter. It was like a throwback to the JVG era. This photo is indicative of the kind of game Yao had against the Pistons on Thursday night. On this play, Yao did his patented spin move toward the baseline, leaving Rasheed Wallace in his wake. Yao finished with a game-high 27 points on 10-of-19 shooting, 7-of-8 free throws made, 7 rebounds, only 2 turnovers, and 1 BIG BLOCK. Click here for more photos from the game. Click here for pre-game photos. Through 3 1/2 quarters Thursday night, it appeared the Rockets were on their way to having another “statement game” similar to the 50-point win they had Sunday night in Philadelphia. This time, they held a big 18-point lead with only 8:18 remaining in the game against arguably the best team in the Eastern Conference, the Detroit Pistons. The Pistons had won their last 6 road games, and 6 out of their last 7 games overall. So they are for real in a fairly weak East. And in this game they were playing with Chauncey Billups, who has been out with a groin injury lately. This game was on its way to being a bona fide dismantling of Detroit, and I could only imagine what journalists and teams in the League were thinking about Houston. Well, after blowing that 18-point lead and letting Detroit close within 4 points with 2:31 remaining in the game, many of those potential accolades went out the window somewhat. Houston would hold on for a 91-85 win, which is impressive, but not as impressive as it could have been. But I don’t care much about how a team looks when they win as much as I do with their ability to win close games any way they can. Houston has been learning lately how to close out tight games (remember the Indiana game Tuesday night? ), which is undoubtedly going to be a necessity to win in the playoffs. Yao comes out to the perimeter to limit Tayshaun Prince offensively in Detroit Saturday night. Yao had a monster night statistically (33 points, 16 rebounds, 4 assists), but was limited to two points in the fourth quarter on the way to a 104-92 Rockets loss. Click here for the game story. For more photos from the game, click here. The Rockets had a golden chance to make a statement about the kind of team they are Saturday night against Detroit in Auburn Hills, and for 3 quarters, they were looking pretty good. 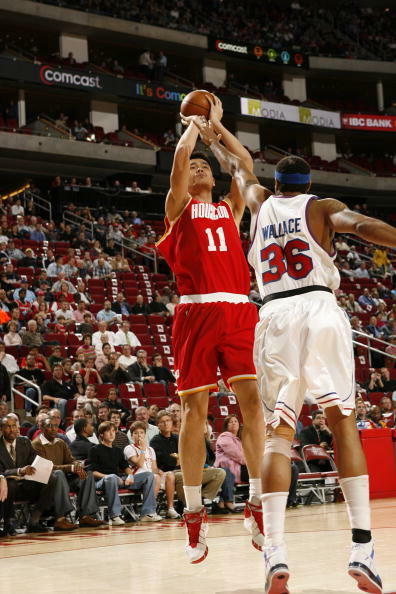 Yao was dominating through those first 3 quarters, scoring 31 points. T-Mac had started the game hot, scoring 8 of the Rockets first 10 points, and 13 of their first 19, not missing a shot and looking like he was on his way to a 30+ point night. But the problem was that the other Rocket players weren’t shooting well (12-of-35 for 34%), and when Yao (two points in the fourth quarter) and T-Mac cooled off, and the defense couldn’t stop the Pistons in the final quarter, it was a recipe for disaster and a 104-92 loss. Detroit had gone on their own dry spell in the second quarter when they missed 10 shots in a row and fell behind 34-26. But you knew the Pistons, only two seasons removed from a World Championship, were too good of a team to fold and die. They came roaring back and managed to close their deficit to 52-50 at halftime. Both teams played to a stalemate in the third quarter (26-26), leading to the Rockets collapse in the fourth quarter where they were outscored 28-14. Giving up 104 points to the Pistons is surprising considering the Rockets headed into the game giving up the least number of points per game this season on the road (about 91) and Detroit averaged about 90 ppg. Detroit’s defense did a good job forcing Yao and T-Mac farther from the basket, making the Rocket offense bog down, resulting in turnovers and bad shot selection. T-Mac only hit 2-of-7 field goals in the second half and scored 24 points. He was also limited in playing time because of foul trouble, a rarity, but considering he was playing against Richard Hamilton, it’s somewhat understandable. The Rockets turned it over at least 5 times in the fourth quarter (two by Yao), went 7 minutes without a field goal, and shot only 26% (5-of-19) while Detroit went on a 13-0 to put the game out of reach. One thing is for sure. T-Mac needs to stop shooting 3-pointers. He was 1-for-5 in the game, and is shooting 28% from behind the arc for the season. Yao was phenomenal in those first 3 quarters, giving the Ben Wallace-less Pistons problems down low, getting fouled numerous times, and making them pay by hitting 17-of-20 free throws. He also threw several nifty passes for 4 assists, and only committed one personal foul. On the downside, he turned the ball over 8 times total. The Rockets next play the Knicks in New York, and I have a bad feeling about that game. The Knicks are very explosive and gave the Rockets all kinds of fits last week in Houston. ClubYao’s correspondent in Hong Kong, Raymond, has translated a Sina.com article from Chinese to English reporting some of Yao’s and Jeff Van Gundy’s thoughts after the Pistons game on Friday night. You can read those quotes by clicking here. Thanks Raymond! Yao prepares to make a strong move against Detroit’s Ben Wallace. Yao showed lots of aggressiveness all night, played 37 minutes, and recorded a double-double (20 points and 12 rebounds). But the rest of the Rockets struggled, and the Rockets lost again, this time 78-70. For more photos from the game, click here. Photo courtesy of NBAE via Getty Images. Like the Rockets, it has been a long week for me at work and I’m dog tired, so this is going to be a relatively short report. Watching the Rockets play the Pistons didn’t give me any extra energy since the game was relatively boring and low-scoring. Both teams couldn’t score (39-36 at halftime), the same number of points was scored in the second half, and the Rockets lost 78-70. The only real excitement in the game was watching Yao take Ben Wallace to school, showing aggressiveness down low and scoring 20 points on 8-of-14 shooting. And although Houston’s offense was sucking again (except for Yao), the Rockets managed to keep it close and had a shot at the end to win it. You are currently browsing the archives for the vs. Detroit category.